The main course here is the second of Franz Schmidt's four symphonies (1896, 1913, 1928, 1933). The Strauss is a dessert in this company. Franz Schmidt's music never quite gets a grip on the sunlight of general public affection. It alternates between recess in deep shade and the full blaze of exposure. Concert performances have been even fewer than appearances on disc. He was by no means totally ignored in the days of LP as Mehta's still very worthwhile Decca Fourth Symphony, also with the VPO, shows. That said the era of the compact disc from 1983 has been kinder with Schmidt symphony cycles by Naxos (Sinaisky), Chandos (Järvi), Querstand (Fabio Luisi) and Opus (L'udovijt Rajter). The Symphony No. 2 was premiered by the Vienna Court Opera Orchestra in 1913 under the work's dedicatee, Franz Schalk. It was first performed by the VPO under Felix Weingartner in 1914. In the last five years there have been concert performances of the Second and Bychkov has been behind all the recent ones I know about: RAM, London, 2014; VPO in Vienna 2015; Proms 2015. Clearly he knows the score inside out. That said, first impressions were not winning. The recording seemed to lack the heft, 'whoomp' and wallop I expected and wanted. I played the disc again and again - at the very least it was drawing me back. What it needs, I found, is to be driven at a higher than usual volume. With this setting correctly made the recording and reading registers with strength, poetry and gorgeous power - and at times it is an overwhelming strength. Listen to the tam-tam at 9:12 in the first movement and 7.00 in the second and discover that the merits lie not just in Schmidt's majestic brass writing. Bychkov and his orchestra are not abashed by the at times suffocating density of intertwined melodic lines. These are most frequently spun alluringly by the strings. There is simplicity to be relished as well. An example of this is in the irresistibly mellifluous burbling rivulet of an idea that launches, drives forward and underpins the whole work. Schmidt, as we discover, knows how to tap into the spindrift leaf-rustle of summer ecstasy as well as look forward to autumn. There are other Schmidt Second Symphony recordings including classics by Mitropoulos and Sinaisky. The former is from one of the VPO's golden ages. Among modern releases I would single out the lush one from Järvi and the Chicago Symphony as part of a four-disc Chandos set. I should also mention Erich Leinsdorf/Vienna Philharmonic Orchestra on Andante 4080, Fabio Luisi/MDRSO on Querstand VKJK0504 and L’udovit Rajter/Radio Bratislava Symphony Orchestra on Opus 9310 1852. Strauss's Träumerei am Kamin (Dreaming by the Fireside) is one of four little interludes from the composer’s opera Intermezzo. I say 'little' but this one has all the sleepy sonorous weight of deeply ploughed emotion and heavily flowing sweetness. Its congealed sighs (4.35) recall the Hollywood doom at which Franz Waxman was such a past-master. It's a pity that all four of the Interludes were not included: it would have been feasible. The useful liner note is by Harald Haslmayr and is in English, German and French. Where will the open-minded Bychkov, who is often heard in both London and Vienna, turn his attention next? I have a suggestion that is related to the mien and lyrical riches of this Schmidt symphony: It is the hour-long four-movement Ein Herbstsymphonie (1921) by the Austrian composer Josef Marx (1882-1964). This work was championed in the concert hall in the last few decades by Michael Swierczewski and Leon Botstein. It is receiving its first performance in London (RFH) on 29 November 2017. The LPO will be conducted by Vladimir Jurowski. It would be a perfect fit for Bychkov. 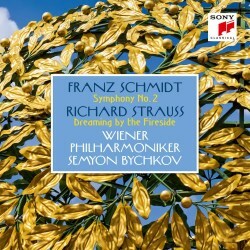 Meantime this is a gorgeous single-disc introduction to the work of Franz Schmidt.